Tiffany Villarin, Megan Hill, Ugo Chukwu, and Justin Long in “Do You Feel Anger?”. Photo Credit: Carol Rosegg. Is empathy a kind of bird? Will Janie ever emerge from the bathroom? And what, exactly, is a “piss chart”? These questions, and a healthy stream of others, are likely to blaze across your mind while seeing “Do You Feel Anger?”, a new play by Mara Nelson-Greenberg that opened at the Vineyard Theatre Off-Broadway earlier this week. A razor-sharp, whip-smart satire of contemporary workplace culture, “Do You Feel Anger?” is the blissful antithesis of complacent theatre-making in which you never quite know what is going to happen next. Equal parts hilarious and horrifying, Ms. Nelson-Greenberg, director Margot Bordelon, and their cast serve up a highly digestible, surrealist critique of mores around empathy consciousness, sexual harassment, hyper-masculinity, and female agency. Set in the conference room of a debt collection agency, a young empathy coach named Sofia (Tiffany Villarin) arrives for a four-to-five week workshop designed to train the employees in “compassionate communication” with each other and the people they phone on behalf of their clients. There she encounters a battleground of primitive leanings and aggressive behavior. Eva (Megan Hill) keeps getting “mugged” on her way to the office kitchen and always keeps a boyfriend, no matter how unforgettable or abusive, to avoid being hit on by her male co-workers: the “poet” Jordan (Ugo Chukwu) and rageful bro Howie (Justin Long), both of whom unironically exclaim the merits of “unreciprocated blow jobs”, alongside their boss, Jon (Greg Keller), and seem to lack basic facility with language and emotion. A fifth co-worker, Janie, went to the bathroom “many days” ago and hasn’t been seen since. The men are idiots. The women terrified but smiling. I’ve rarely seen a better dramatic distillation of America in 2019. Ugo Chukwu, Megan Hill, and Justin Long. Photo Credit: Carol Rosegg. Sofia’s lessons and exercises are punctuated by a series of increasingly desperate voicemails from her mother (Jeanne Sakata)—whose husband has just shared the existence of a secret family—as she navigates the toxic office culture she’s encountered, bends to meet it, “solves empathy”, and discovers what’s really going on in the women’s bathroom (no spoilers here, but the reveal is quite satisfying). In a program note, the Vineyard Theatre’s artistic directors Doug Aibel and Sarah Stern share that when they first read the script they immediately felt they “were in the presence of a vital new voice for the theatre”, and I agree. 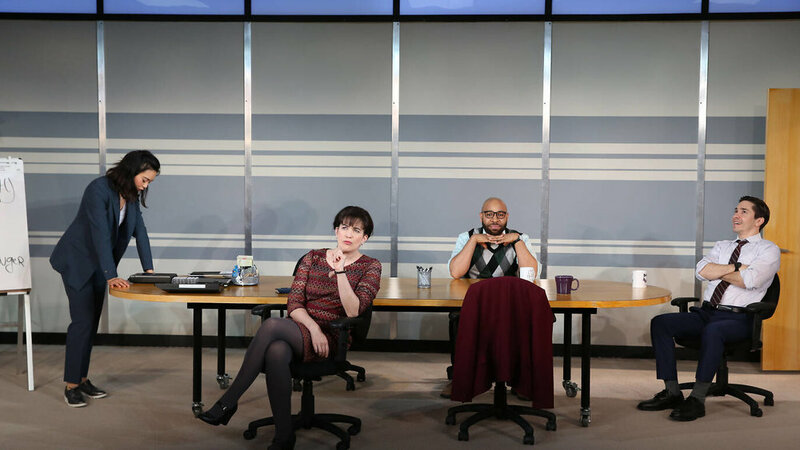 Ms. Nelson-Greenberg has smartly crafted a comedy that is dead serious, tapping into the truths of our modern existence and workplace relationships without feeling derivative or didactic. As our culture paradoxically becomes increasingly fractured and more aware of the need for empathy, this play—and the keen questions it probes—could not be more timely. Bottom Line: Mara Nelson-Greenberg’s new play “Do You Feel Anger?” at the Vineyard Theatre is a razor-sharp, whip-smart satire of contemporary workplace culture that is the blissful antithesis of complacent theatre-making, this play serves up a highly digestible, surrealist critique of mores around empathy consciousness, sexual harassment, hyper-masculinity, and female agency that is equal parts hilarious and horrifying.